Mix all dry ingredients; whisk in egg and beer; whisk in parsley. Peel potato and cut into matchstick sized pieces on mandoline; run under cold water to rinse excess starch. Dry potatoes on absorbent paper towel; dredge in flour and deep fry for about 2-1/2 minutes, or until golden brown and crispy. In a mixing bowl combine egg yolk and mustard; slowly add oil, whisking very rapidly, until all oil is emulsified into yolk. Whisk in lemon juice and vinegar. Fold in pickles, caperberries, onion, herbs; season with salt and pepper. 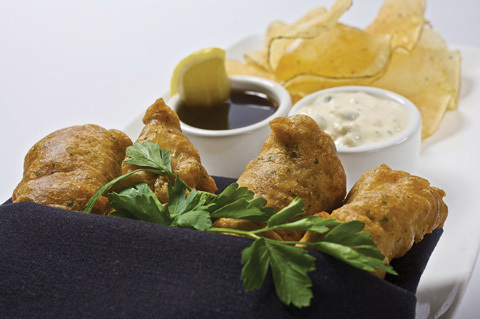 Dredge anchovies in cornstarch, shake off all excess cornstarch; holding them by the tail, dip anchovies into beer batter and allow excess batter to drain off for about three seconds. Fry anchovies in deep fryer for 2 to 3 minutes each, until brown and very crispy. Serve with “Tartar” Sauce and small pile of shoestring potatoes.